Enjoyable, civilized, yet somehow not as satisfying as "Persuasion," another recently released Austen adaptation. "Sense and Sensibility" was the first and one of the least of Jane Austen's novels; she wrote it in 1795, but it was not published for 16 years, until she had found the courage to declare herself as a novelist. It was written by a young woman who ostensibly had little experience of the world - although her fiction proves she missed little that occurred on her domestic stage - and the story reflects that orientation, as a mother and her three daughters wait passively while all of the interesting men in the vicinity disappear on unexplained missions to London. In a modern story, the women would have demanded explanations. What gives "Sense and Sensibility" its tension and mystery is that the characters rarely say what they mean. There is great gossip within the women's sphere, but with men, the conversation loops back upon itself in excruciating euphemisms, leaving the women to puzzle for weeks over what was or was not said. As the story opens, the Dashwood estate passes to a stingy male heir, who provides only a few hundred pounds a year to his father's second wife and her three daughters. The widow Dashwood (Gemma Jones) and her girls find themselves torn from the life of country gentry and forced to live on this meager income in a cottage generously supplied by a distant relative. It is now the task of the girls to find themselves husbands. The oldest, Elinor (Emma Thompson), is no longer in first flower. The middle, Marianne (Kate Winslet), is in full bloom. The youngest, Margaret (Emile Francois), is still at this point largely interested in tree houses, and hiding under tables in the library. The women spend many hours by the fire at their sewing, waiting for eligible men to drift into their nets, and some of the film's funniest moments have the mother and daughters quickly composing themselves into a tableau of domestic bliss just in time for a man to happen upon them. The first man in view is Edward (Hugh Grant), the brother-in-law of the stingy Dashwood son. He is charming, and definitely interested in Elinor, but as Marianne observes, "there is something wanting." Exactly what is wanting is explained later in the film, when we discover why Edward is prevented from declaring the full extent of his love. Edward leaves suddenly for London. The next man to appear is Col. Brandon, played by that indispensable villain Alan Rickman, who is not a villain this time but seems to be, with his dark, brooding air and the speaking style of a sentimental hangman. He is attracted to Marianne, but before he can act, she is smitten by the dashing Willoughby (Greg Wise), who rescues her from a mishap and charms her off her feet. No sooner have these men appeared when they, too, are called away to London - although not before Col. Brandon has suggested, almost by osmosis, that he knows something unspeakable about his rival Willoughby. His secret is the sort of thing that would not be a secret long in the modern age, but in Austen's time, such things were not spoken of, and Brandon might even allow Marianne to make a disastrous marriage rather than tell her what her maidenly ears should never hear. This maddening, intriguing inability to simply blurt out the truth is indispensable to 19th century fiction, and I find it enormously satisfying. Better the character who leaves us to guess at unspeakable depths than one who bores us with confessional psychobabble. The men's departure to London leaves the three daughters and their mother facing an indefinite future in their sewing circle. So when a kindly relative proposes a visit to London, they seize upon it with desperation, and it is there that secrets are revealed and alliances are smashed or formed. The screenplay, adapted from Austen by Emma Thompson, takes wicked delight in setting up scenes that would be farce in France a few generations later, but here still play as drama (with an undertone of dry humor). The scene, for example, when the hapless Edward (Grant) finds himself unexpectedly in the presence of two women, neither one of whom should know about the other. "Sense and Sensibility" has been directed by Ang Lee ("The Wedding Banquet," "Eat Drink Man Woman"), who is from Taiwan, and whose choice for this assignment has been questioned. Yet surely a modern upper-middle-class Chinese person has more familiarity with Austen's varieties of family ties and marriage responsibilities than a modern Briton. Romance is only one of the reasons for marriage in Taiwan, where family alliances and social class still play a role, while in modern Britain, as in America, young lovers hardly seem to recall their own earlier years, let alone their family traditions, if any. There are obvious parallels between this story of a mother who wants to see her girls happily settled and the two earlier Ang Lee films, which were about parents with much the same concerns. 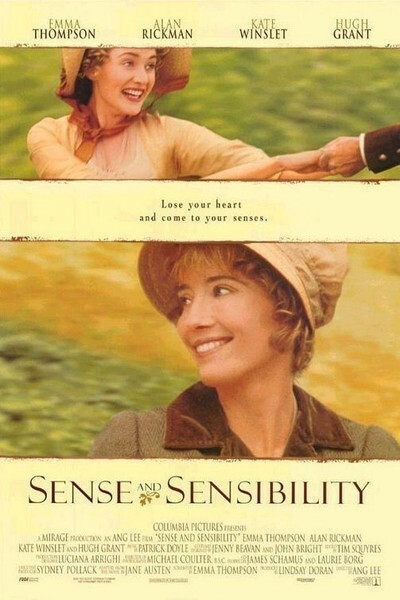 "Sense and Sensibility" is an enjoyable film, and yet it left me somehow unsatisfied. I liked the wit, I liked the charm of the actors, I enjoyed the way that Rickman chewed his role as if he wanted to make it last, and the tension when Grant's Edward is made to suffer - particularly since he appears to be a cad only because he has tried to do the right thing. And I appreciated the way Thompson's Elinor kept her character's face carefully expressionless as she negotiated scenes in which some knew her secrets and others did not. Yet the film is not told as tightly or as well as "Persuasion," the wonderful Austen adaptation released earlier in 1995. Austen was not yet a great novelist when she wrote this story, and there is too much contrivance in the way she dispatches her men to London when she is done with them. Edward is off-screen so long that instead of growing concerned about his absence, we forget him. The production suffers from comparison with "Persuasion" because the earlier film looked simpler and more authentic, and this one seems a little too idealized; we want notepaper, not picture postcards. "Sense and Sensibility" is entertaining and amusing, but "Persuasion" is the one true Jane Austen lovers will prefer. A great love story: "Brokeback Mountain"